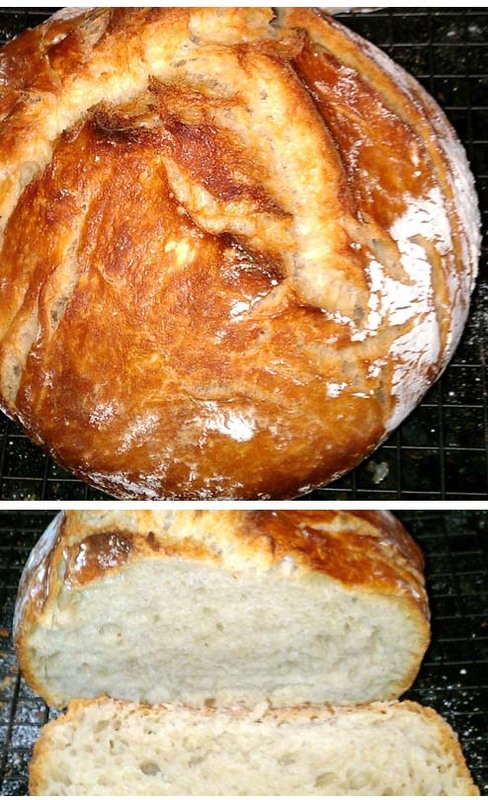 Delicious and simple dutch oven bread recipe that you can make with common ingredients in your kitchen. Just keep in mind that the bread dough has to be set overnight so plan accordingly. Enjoy! In a bowl, combine flour, yeast, salt and water. Stir until the mixture is spongy. Prepare a separate bowl and grease it up with olive oil. Transfer the dough into the bowl and coat it with oil by rolling the dough over and over as necessary. Cover the bowl with a towel and allow the dough to rise for 12 hours. When you're ready to finally bake the bread, preheat the oven to 500 deg F with the dutch oven pan inside. Prepare the dough for a nice crust. First, layout a cotton towel on a table. Spread a handful or more of flour (or cornmeal or oatmeal) on the towel. Place the dough on top of the towel. Roll it slightly to fully cover it with flour. Sprinkle some flour on top to be certain. Fold the towel to wrap the dough. Set it aside and let rise some more for another 2 hours. Remove the dutch oven pan from the preheated oven. Transfer the dough into the dutch oven pan. Be careful because it's hot. Put dutch oven pan with dough back into the oven and bake with the lid on for 25 minutes.